Note that if you buy the Paperback version, Amazon makes the Kindle version available to you at no cost. That's right. You pay zero pesos for the digital version if you also buy the analog version! Many of you have kindly stepped up to ping me about mistakes in the book. 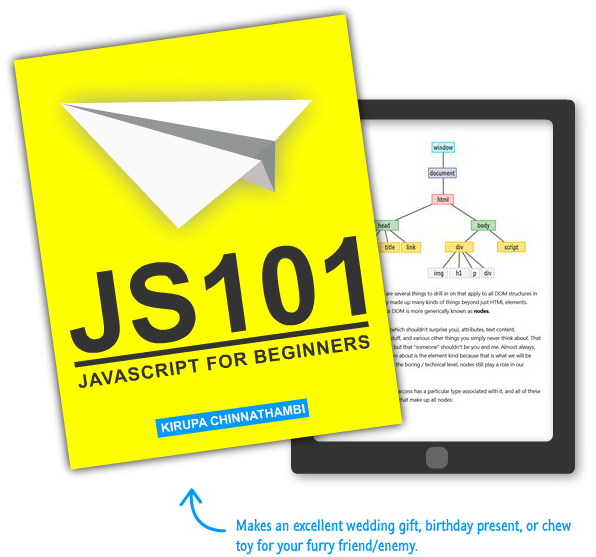 You can see the current list of the issues and how to fix them in the Corrections - JS101 post. You can also download this sample chapter as a PDF for reading locally if you aren't into the whole "iframed PDF in a browser thing." Also, don't forget - the Kindle versions of the book are in full color and are available for free if you purchase the paperback editions from Amazon! Before I go and wrap things up, I just want to say THANK YOU!!! I am most happy when I get to write and share something cool that I learned to do. If you just happen to laugh a lot along the way, that is an added bonus...kinda like an extra dousing of butter on an already butter-soaked tub of popcorn. You just can't beat that! The other thing that makes me really happy is when I get to hear from you. Feel free to reach me at [email protected], on Facebook, or on Twitter. Also, if you are ever in the Seattle area and want to chat over coffee or bubble tea, I am totally up for that as well.